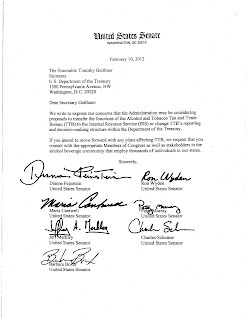 I contacted the offices of my two Senators who signed the letter, Dianne Feinstein and Barbara Boxer. Feinstein asks me regularly for campaign contributions for herself and other Democrats, but her staff could not be bothered to respond to a question about a political issue. Ditto Boxer, who at least doesn't come begging to my inbox every month. I have to wonder if Feinstein and Boxer are even paying attention to what they allow their names to go on. I will be interested in seeing how it plays out. In the very big picture, of course I stand with the Wine Institute on most political issues. That said, I wonder if this sort of arrogance, both in reflexively opposing a minor change and refusing to explain why, might eventually backfire. Moreover, one area where true wine lovers' interests diverge from that of the Wine Institute is that the latter always stands for big business in wine because that's where the majority of its financial support comes from. Usually wine lovers' interests in US law coincide with Gallo's interests, but not always. Could this excise tax enforcement proposal be one of them? I'll admit again, excise taxes aren't my specialty. Considering the lack of information I got from the Wine Institute on this, I'd be grateful if some of you reading this could explain further why the Obama administration's proposal would be bad for wine, your winery, or the industry as a whole. Thanks. I guess I don't see why this minor change is an issue. Most of these wine excise tax calculations aren't rocket science. All the numbers must match up with winery operations reports submitted on a regular basis to TTB (which, I'm assuming, wouldn't change). So IRS staff could do the time-consuming step of checking for agreement between those reports and tax returns. If they differ, IRS could ask for written clarification from the winery and turn over the document to TTB for a knowledgeable examination. It would be like providing an admin assistant to TTB. On the flipside, I've got some pretty substantial claims for credit for overpaid excise tax (due to lower tons crushed than anticipated), which I hope will be processed in a timely fashion. Maybe this increased assistance would get us credits faster? Mr. Obama's 2011 budget was voted down in the Senate 97-0. 2012's budget doesn't have legs, either. It is true, some ideas are introduced and then take on lives of their own in future bills. But for now, they're right. It is not happening. I am a compliance consultant and I deal with excise taxes on a regular basis. I too don't see an issue with the IRS staff taking over a portion of the duties. The TTB is proclaiming that they are understaffed (and overpaid in the eyes of some) and not able to tend to some very serious matters. Delays in processing returns and credits are all to common. Plus, if everyone is paying their excise taxes and complying with the various rules and regulations, involving the IRS shouldn't be of any concern. But if the WI objecting on the basis of the possibility of a slippery slope, they could be right. Anon: However, a budget of some kind will eventually be passed. This change seems so innocuous to me. No doubt it would be easy to get the administration to remove it in negotiations. But consider who the administration would be negotiating with. 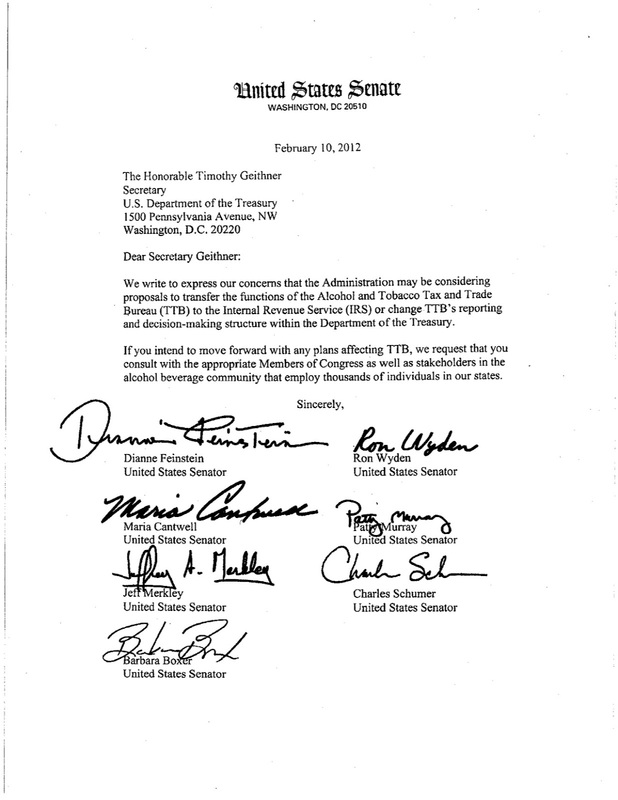 The Senators who signed the letter are already on Obama's side. This isn't a concession he'll have as a bargaining chip. Politics aside, I still just don't get why this change would be a bad thing. Don't you see? Somebody wants the irs looking over our shoulder. And somebody else doesn't. The Wine Insttute sure thats there job, but I think the ttb doesnt want it too--it would make them look stupid if someone took it over and saw. I think somebody is asking questions and making people nervous. When times get tough, big brother looks for money. This isn't as simple as it looks. I deal with the excise tax and it makes no sense to me to have IRS deal with part of the picture (tax collection) and TTB to handle the operations reports (which is needed for the excise tax). The other component is the export reports that goes to TTB that also involves excluding wines from the excise. Without this information it would be hard for IRS to know what should be paid. If TTB is understaffed, moving it to IRS means either they have lots of extra capacity (doubt it) or they will also be understaffed. As you often see in business when a business has an issue thier first reaction is to "re-organize" which rarely fixes the problem just moves it around. I have no experience in this area, I’m purely speculating based upon instinct and an appreciation for human nature. When’s the last time you heard of anyone following all the rules when they know no one will check to see if they did? My guess is the lack of oversight by TTB has tempted many to push the envelope or even fudge. For those who have done so, the threat of being found out is not an appealing prospect. Blake, I am taking a wild guess here, but would suggest that these Senators may fear that the IRS may in fact be quite effective at excise tax enforcement, which would, in some minds, threaten the business of many of the wineries, brewers and distillers in the states represented by these same Senators. I am sure they have been lobbied by these business in this regard. Their argument is likely predicated upon the notion that their business volume would be reduced if they were forced (through threat of IRS penalties)to actually collect these taxes. No idea if this is a realistic interpretation, but its my guess. I assume that today, the TTB is good at laying out the law, not so good at enforcement. Kent, you obviously are not in the winemaking business. Mark was almot right. TTB is good at making rules. There not bad at enforcing them. They don't even try. The lazy just lie, no that is 13.9 not 14.2. others turn on the ro and the hose. I know a guy who complained to ttb because his bosses expected him to do it and he didnt like breaking the law. He told ttb anonymous and they called up the winery and asked "you don't do that do you?". Course answer was "no" because they were talking to him the guy that reported it to them. But his bosses expected him to lie. He couldn do a thing. ttb dropped it! Whoa ... is it possible that the Wine Institute doesn't want this to happen because the big wineries are not correctly reporting the alcohol percentages to pay lower taxes? Nah blake, not the really big guys. Its the medium and small guys. The big ones probably have two many lawyers. Other wineries influence wine institute too, especially medium sized. I don't get the speculation that the Wine Institute is opposed to this change because wineries are supposedly not reporting the correct alcohol levels. The change, as reported ih this very blog, has nothing to do with which agency would check alcohol levels...that would still be the TTBs responsibility. The change, as reported here, is simply enforcement based if someone isn't paying their excise taxes (i.e. collections). Adam: The proposed change certainly seems minor. As for why the speculation, well, I asked for it. There has to be some reason to oppose this, right? Why spend political capital unless 1) there's a worthwhile goal, or 2) you're the NRA and have a seemingly bottomless pile of capital to spend? I think wine lovers would love it if point 2 were the case, but point 1 seems more logical. In all of the studies I have seen (SF Chronicle, Wine & Spirits, LCBO) wineries are almost always on the correct side of the tax line. I know that you'd like the leeways narrowed, but that's a very different discussion than anonymous posters (which you have criticized previously) accusing wineries of underpaying taxes and involving the Wine Institute in their attempts to defraud the government. Why would the Senators oppose i? Well, first off the letter doesn't say that they oppose the change. What it actually says is that they oppose the Administration unilaterally proposing to change the functions of the TTB and give them to the IRS. Congress will always push back against such changes, if only because they don't want to give up the power to be in charge of the decision making. Moreover, although both the TTB and the IRS are part of the Treasury Department, the actions of the IRS are rarely questioned directly by Congress (in fact, the set up an IRS Oversight Board so they didn't have to do it themselves). Why give what is largely an independent agenncy more power? I think this has more to do with Washington power politics than anything else. Nobody said that the wine institute knows why some wineries don't want irs. I dont think most people try to just lye about it. And maybe the RO and waterhose got turned on by accident.